I’m on an adding-healthy-veg-to-lunchbox-treats kick. The Sprogs are wise to this subterfuge and requested carrot cupcakes with no visible carrot. I love a challenge, so I hopped to it (groan). They turned out rather well. Sprog 2, however, refused to eat them. She said the frosting was too lemony (after one teeny tiny nibble). Sprog 1 vehemently disagreed. So Sprog 1 has been enjoying them for morning tea this week, while Sprog 2 has been sticking with her usual environmentally unfriendly, over-packaged selection of Fruit Flakes, Shapes and Cheesestiks. Steam or boil the carrots until soft. Mash with 1 tablespoon orange juice and 2 tsps ginger. Beat butter and sugar together with an electric mixer until pale and fluffy. Add eggs, beating, one at a time. Add vanilla, skim milk and carrot mixture. Beat together until combined. With a wooden spoon, gently mix in flour. Spoon mixture into a patty-case-lined cupcake tray. Bake at 180C for 20 minutes, until golden. LEMONY CREAM CHEESE ICING: Mix together 125g of cream cheese, 1/2 cup of icing sugar and a tablespoon of lemon juice and give each cupcake a generous swirl of the stuff. 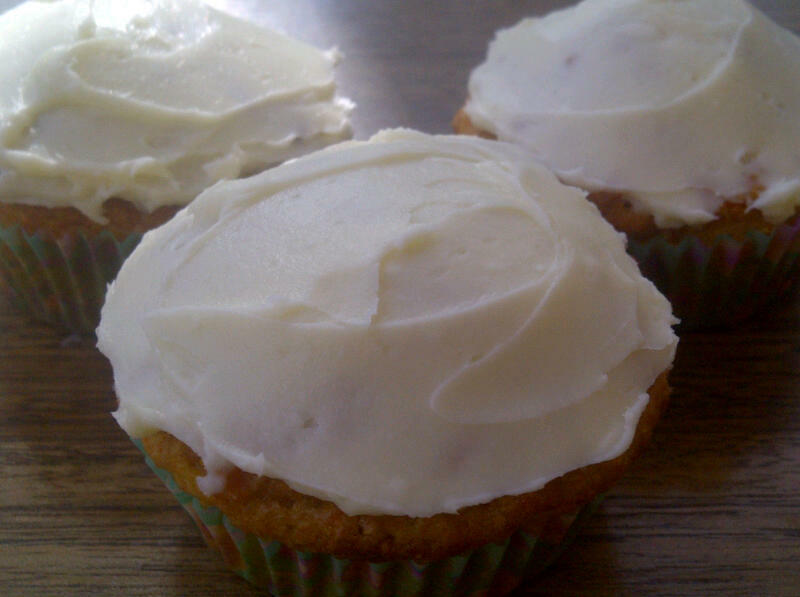 This entry was posted in RECIPES and tagged carrot, cupcake, lemon frosting, recipe. Bookmark the permalink. Is ‘bottled ginger’ the ground ginger powder or the moist paste? My No1 is very fussy about Lemony flavours, I always have to tone it down for her!